As a CRNA Traveler, you have a couple of options for obtaining a new assignment. 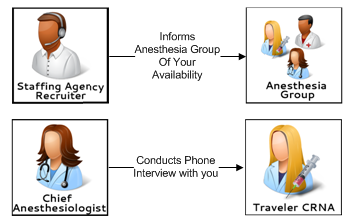 You can either choose a Staffing Agency, that specializes in placing CRNA’s or you can choose freelancing your services by contacting out to Anesthesia Groups, independently. The following Flow Diagram will help you to familiarize yourself with both the players and the steps involved from deciding to travel up until the first day on the job. Once you’ve decided to become a Traveler CRNA, you may contact various Locum Tenens Staffing Agencies—OR they may reach out to you. The immediate advantage with a Staffing Agency is their list of exclusive locum tenens jobs (full and part-time) in great locations along with their established relationships with the facilities. 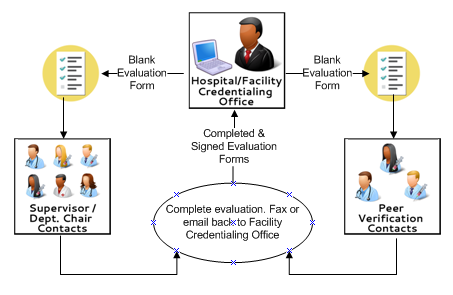 Additionally, they can provide help with providing your documentation to the Facility Credentialing Office. There are several professional entities that will play a major role in the successful credentialing of a new appointment. 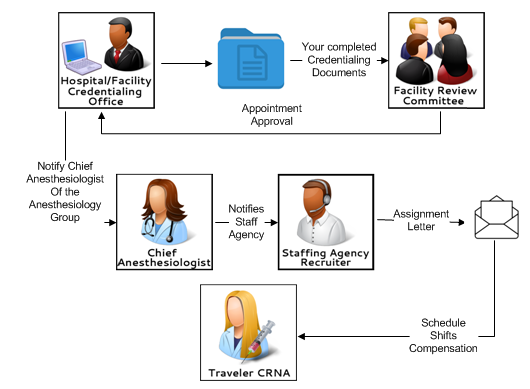 The following text and flow diagram scenarios outline obtaining a new assignment via using a Staffing Agency. If you are freelancing, the process is the same but without the Staff Agency. You will need to establish your company as an LLC or S-Corporation and will be the main point of contact throughout the process unless you have an assistant. With your consent, the Staffing Agency contacts the facility Anesthesia Group and provides them with your CV and available appointment dates. The Chief Anesthesiologist will want to conduct an interview with you (most likely by phone call). Based on the satisfaction of the interview, the Anesthesiologist Group gets back in touch with your Staff Agency with their approval. They may also verbally request some peer references from you. So it's good to have names and numbers handy. A contract is created between the Staffing Agency and you with the details of the appointment (start/end dates, rate, etc.). 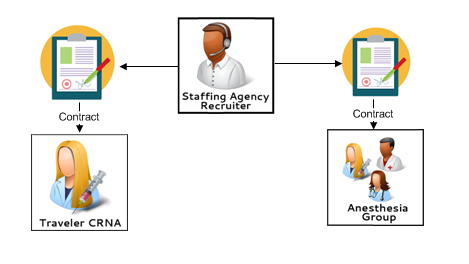 A second contract is created between the Staffing Agency and the Anesthesia Group for your services. for a list of what you should always have current, up-to-date, and ready to provide. Documentation to explain any infractions, restrictions, disciplinary actions, etc. Explanations / Suite History for any denial of Personal Liability coverage, judgements, claims, etc. The Facility Credentialing Office will assemble and organize your information into an application that will later be used to verify that everything you gave them is true. You will be sent this application prior to verification for authenticity, either by USPS or in a DocuSign online document. This application is often times lengthy and received late in the credentialing process. If it is incorrect changing it at this time will most likely delay your start date. Making sure the contact information for references and employment verification is accurate and current will help to expedite this process. Also, the application will require your signature and initials along with the current date. (This may be why credentialing officers hold back your application, to avoid mishaps between signing and start dates). After the Facility Credentialing Office receives your signed attestation, they will begin to verify all of the information within the application. This involves phone calls to the facilities where you have worked and emails with attached reference forms to be completed by your various contacts. Your Staffing Agency may be able to provide you with assistance. Some facilities partner with companies like Parallon https://parallon.com. You may need to register with their site to keep aspects of your data up to date. Additionally, facilities may rely on third party credentialing databases such as CAQH Proview – https://proview.caqh.org. Again, you may be required to establish an account and keep the data gathered on you current and correct. It’s important to notify your Peer References at the very least that they will be receiving some form of evaluation from the facility at which you are making application. Also, keep a Facility Verification Contact List of professionals at the facility that can verify your employment. In the even one of your Contacts is unreachable, you can supply an alternate contact that will verify your employment. Check periodically that your references are still valid and available to vouch for you! Upon successful completion of the Credentialing Process, your verified documents are forwarded to the Facility Review Committee for final approval of your appointment. The committee notifies the Credentialing Office which in turn notifies the Anesthesia Group. The Anesthesia Group notifies your Staffing Agency Recruiter who then sends you the Assignment Confirmation Letter.